Why do bluetooth headsets get interference (choppy sound quality) outdoors? This is more of a general physics question to help me understand how to choose sports headsets in the future, however it is too specific to a certain use case (bluetooth headset) to belong in the Physics StackExchange. 3 of my 4 sports bluetooth headsets suffer from choppy sound quality (signal interference?) the minute I step outside. It seems to be especially bad under a clear sky no matter the time of day. The 4th and the most expensive headset does not suffer from this, but it has a different (more compact) design. The worst performance was by the cheapest sports headset (from ebay) and it was unusable outdoors. In all cases my phone is located in my trouser pocket, but moving it closer to my head (the headset) seems to lessen signal interference, but not remedy the issue completely. In all tests the headsets have been fully charged. The speed of movement also seems to play a factor, but I am not able to reproduce that affect every time. I can say that clothes are not a factor, as the same clothing indoors produces no interference. background EM radiation coming from outer space? EM radiation coming from our sun? Although I have not observed if the moon reflecting the EM from the Sun plays a part or not. As you might have already realized there is a good reason that some of Bluetooth headset are inexpensive. Poor design. High quality, well designed Bluetooth headset tend to be expensive. Also not all expensive Bluetooth headsets are high quality. While it is difficult to root cause failures without physically analyzing the hardware, I will provide some possibilities. Since the device is a handset the device is using Bluetooth classic. Either way some understanding of Bluetooth technology might serve well. Bluetooth operates in the 2.4 MHz frequency band, more specifically between 2402 and 2480 MHz frequency. If the 2 MHz bottom and 3.5 MHz upper guard band are included then the total bandwidth is 2400 to 2483.5 MHz. Bluetooth classic uses 79 channels, of which each channel has a 1 MHz bandwidth. More importantly Bluetooth uses a radio technology called frequency hopping spread spectrum, and if adaptive frequency hopping (AFH) is enabled it usually performs 800 hops a second. Bluetooth divides data into packets and each packet is transmitted on one of the 79 channels. 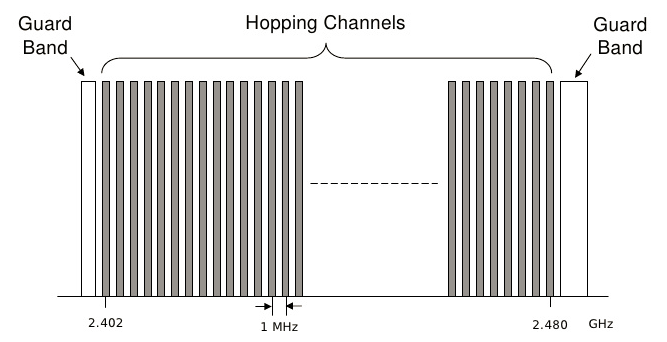 When transmitting each of the data is subjected to path loss (or path attenuation). That is when the propagation of electromagnetic waves is subjected to a reduction in power density. In your case this path loss is influence by propagation medium such as dry or moist air as well as distance between the transmitter and receiver. In your situation propagation losses would include absorption loss or penetration loss which a when the signal passes through a medium not transparent to electromagnetic waves or diffraction losses, which is when the radio signal is obstructed by an opaque obstacle. The signal transmitted by your device also takes multiple paths before arriving at the receiver. The signal received by the receiver might vary in strength, and propagation time etc. A well designed system will account for all of the above and many more factors. In your case the inexpensive headset might have low Receive Signal Level (RSL), or might not have accounted for fade margins. A good design will include about 20 to 25 dbm fade margin. So if your headset has a RSL of 40 dbm, and a receive threshold is about 60 dbm. The design has accounted for 20 dbm of fade margin. Also note that different environmental factors cause different level of signal attenuation. Example a water drop can cause about 5 dbm of attenuation. Not all environmental factors are present at all times. Depending on the application designer choose applicable fade margins. I hope I have given you a good over view of Bluetooth, Radio Frequency and electromagnetic propagations help you make an informed technical decision on your next purchase. Not the answer you're looking for? Browse other questions tagged electrical-engineering telecommunication wireless-communication or ask your own question. Protecting device from microwaves in microwave oven.. but allowing Bluetooth? Why do elevators get stuck? Why is Li-Fi faster than regular wifi? Why don't cellphones use unidirectional antennas? Why not only GSM (3G/4G/..)? Why do we need Bluetooth, Wifi,etc…?